1st Gear: Maybe This Is A Promise Elon Can Keep? Tesla founder Elon Musk, a guy with a history of over-promising things, has been adamant that production for the Model 3 will begin in July. And it probably should, if Tesla wants to maintain its status as the most valuable automaker in the U.S. 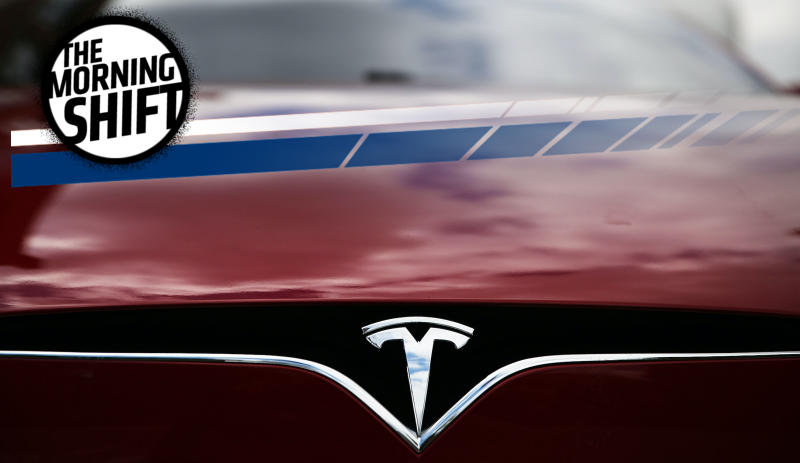 The more-affordable sedan has been cast as a make-or-break product for Tesla. That’s what made a story last week out of Germany all the more interesting: Tesla’s recently-acquired industrial robotics unit, Grohmann, threatened to go on strike, reportedly over wages and a decision by Tesla to drop all of its contracts to focus solely on the Model 3. For now, according to an article by Electrek, that situation seems to have been diffused, after Musk personally intervened this week. Electrek has learned that ‘Tesla Grohmann’, or ‘Tesla Advanced Automation Germany’, has been working on two production lines for the Model 3’s inverter. The lines, which sources say are scheduled to ship in the next few weeks, are crucial to volume production of the Model 3. Some employees expressed concerns over losing what they saw has job stability from having several important clients, like Bosch, Daimler, and BMW, but it also gave an opportunity to IG Metall to use the apparent urgency to deliver the Model 3 lines as a potential bargaining chip to expedite a favorable labor agreement with Tesla. We learned that CEO Elon Musk held a Q&A with the Tesla Grohmann employees last week to hear their concerns and sent them a letter this week with an updated offer. Musk said that on top of the 150 euros per month increase, employees will each get a one-time 1,000 euros bonus and 10,000 euros in Tesla shares vested over four years. Maybe July isn’t unreasonable. We’ll see. The high-profile lawsuit between Uber and Waymo has drawn significant attention as the battle over self-driving cars. And rightly so! The alleged backstory of how Waymo came to accuse its former employee of stealing thousands of files on its self-driving car system, before heading off to launch a start-up of his own that Uber later acquired, is weird and fascinating. Tesla Inc. settled its lawsuit against Sterling Anderson, the former director of the electric-car maker’s Autopilot program, according to a copy of the agreement signed by both parties. “Tesla has withdrawn its claims, without damages, without attorney’s fees, and without any finding of wrongdoing,” Aurora Innovation LLC said in an emailed statement. Aurora agreed to reimburse the cost of an audit to “demonstrate the integrity” of its intellectual property. A California state court docket listed a notice of the settlement on Wednesday. Tesla confirmed in an emailed statement that the lawsuit has been settled and said it’s been paid $100,000. Tesla, as part of the settlement, can audit Aurora’s stuff a second time by next February, and Aurora agreed to provide names and titles of any former Tesla employees joining Anderson’s new company. Neither Tesla nor Aurora admitted wrongdoing, according to Bloomberg. Tesla withdrew the claims before Aurora could file a response to the original suit, which makes me wonder what might’ve been disclosed. Carmakers say they want an electric revolution to wash over the auto industry, despite low sales and the current penchant for crossovers and SUVs. While that’s a noble goal, it’s not being held up solely due to consumer demand; there’s a gaping need for infrastructure to charge those EVs. There’s certainly been improvements on that front over the last year, but a story in the Detroit Free Press shows there’s still plenty of work to be done. Fear that an electric car might run out of juice before the driver can charge up again has a name — range anxiety — and some energy experts believe the best way to overcome it and boost the acceptance of electric vehicles in Michigan is to add more charging stations. The state has 330 public charging stations, and they are not spread evenly around the state, which is believed to be home to about 9,500 plug-in electric vehicles. Tesla, which produces some of the most popular electric vehicles, is the only automotive company with its own widespread charging station network to serve its customers, according to Larry Ward, executive director of the Michigan Conservative Energy Forum, which promotes renewable energy and energy efficiency. Range anxiety may seem silly when there’s affordable EVs capable of cruising 200 miles on a single charge. But the Average Joe Consumer needs some extra comfort to be convinced about EVs. If there’s not enough infrastructure to assuage their fears, it’s hard to see how they’ll ever get there. Until recently, Toyota was one of the industry’s major hold-outs against full electrification, and planned to more or less skip all-electric battery cars and turn instead to hydrogen as a mainstream alternative to gasoline-fueled cars. In 2013, Toyota Chairman Takeshi Uchiyamada, father of the gasoline-electric hybrid Prius, told Reuters the hydrogen car was a “practical alternative” to the traditional combustion engine, and if there was any use for the electric vehicle (EV), it was “only as a neighborhood errands car”. Fast-forward to late last year, and Toyota said it had begun developing a long-range all-electric battery car, which industry experts say should hit the market around 2020. The Japanese firm has put its president, Akio Toyoda, in charge of a new unit called the EV Business Planning Department. There’s always the Camry, I... guess? Nio, formerly NextEV, has lined its coffers with big-name investors, recently closing a second round of funding led by tech firms Tencent Holdings Ltd and Baidu Inc, Li said. He declined to state the size of investment or the automaker’s valuation. The vehicle Nio revealed, a seven-seat fully-electric SUV called the ES8, is going to hit the market next year at a lower price point than Tesla’s Model X, Li told Reuters. It looks like an interesting vehicle. But hopefully Li didn’t just write his company’s own obit. Neutral: I mean, it’s a simple question that’s been bandied about quite a bit—but Tesla seems to have the gears in motion to reach Musk’s July target date for production. Do you think it can actually meet this particular goal?